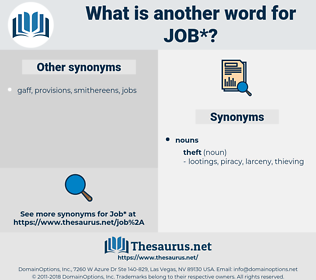 What is another word for job? To buy, sell, work, etc., by the job. qualifications, reports, Vacancies, Abilities, Capabilities, benefits, officials, Policies, points, Facilities, games, Nurses, features, Workplaces, workplace, task, tasks, labor, work, vocational. Tradesmen, data, chore, mandate, task, contract, undertaking, tenure, legwork, obligation, remit, matter, tradesperson, thing, Activities, spot, endeavour, labor, stuff, reemployment, situation, place, objective, handiwork, achievement, utilization, vocational, craftsmanship, racket, burden. appointed, hired, Served, posed, mailed, started, raised, Did, Got, working. 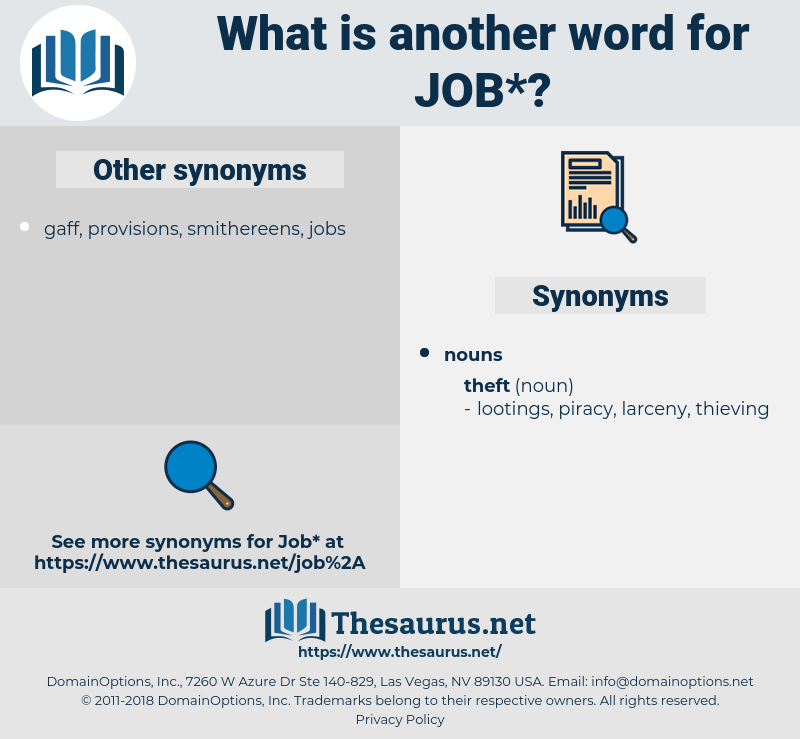 employment-related, jobs, workplace, working, occupational, work. homework, workplace, working, occupational, work. recreation, incompetence, idleness, pastime, entertainment, avocation, inability, unemployment, surrender, fun, hobby. irresponsibility, retreat, disregard, inaction, inactivity. I can't judge if he knows his job; perhaps you can. She must have a father too, Deb, and Peter would not give his job away any more than I would give mine. hagiographa, Ketubim, writings, old testament. situation, berth, employment, farming, land, work, appointment, catering, medium, place, biz, office, confectionery, metier, sport, craft, career, accounting, spot, accountancy, photography, profession, billet, position, post, treadmill, salt mine, trade, vocation, calling, game. responsibility, work, activity, duty, obligation. Applications Programme, application program, application. cheat, work, do work, chisel.